The Surrey village of East Clandon, 4 miles east of Guildford is made up of 110 homes clustered around the communal buildings of the 12th century Church of St Thomas of Canterbury, The Queen's Head pub and the village hall. The tiny 2.25-square-mile (586 hectare) parish landscape at the foot of the North Downs includes a traditional country estate, arable and livestock farmlands, woodlands, a golf course and Hatchlands Park, a National Trust property. The village has been here for well over 900 years having been recorded in the Domesday Book in 1086 and several houses date back to the 16th and 17th centuries. Much of the village is a Conservation area and over 50 buildings are Statutory Listed or Locally Listed buildings. 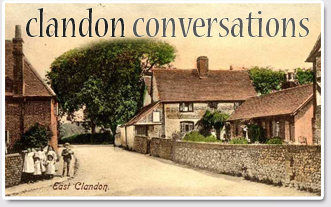 Since 2014 a collection of sound recordings has been assembled of long standing village residents, both past and present, talking of their memories of the village. Some were born here and their memories go back 70 or 80 years. Others arrived in the village 30 or 40 years ago and tell of newer traditions and memories. Click the image below to see the names of the contributors and click through to listen to their recordings.